Buy 5 items for $10 Regularly $63.42 Save 84%! This bundle ended 2017-12-26 18:00:00. Ready for a bundle of games curated for your enjoyment? 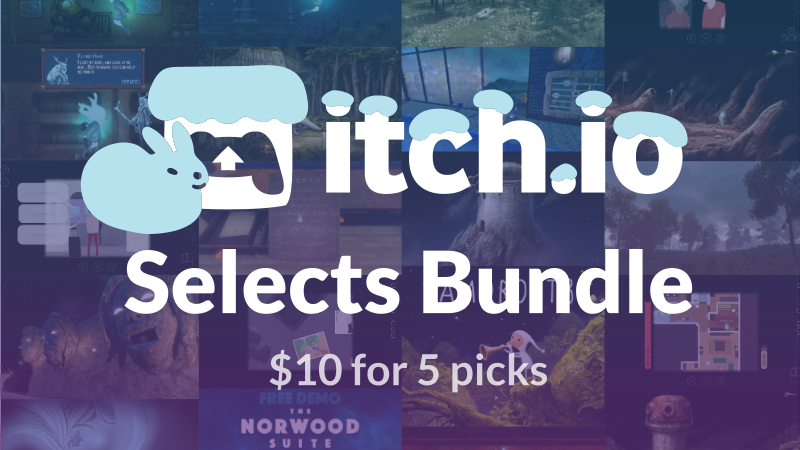 Pick up the itch.io Selects Bundle II as part of the itch.io holiday sales! Hailed as one of the weirdest games of 2017, the Norwood Suite is a surrealist look into what it’s like to be a stranger in a world where you don’t quite understand the rules. The Norwood Suite is a hotel but it’s also a peek into what makes us a community and what makes us outsiders. Spend your holidays on one of America’s most famous ponds in Walden, A Game. Take a look at Henry David Thoreau’s experiment in self-reliance through the lens of an interactive experience and maybe you’ll find yourself both entertained and educated. If you’re looking for a beautiful adventure about what it’s like hunt for your father on the grounds of a haunted mansion you’ve… got shockingly specific tastes but your search has ended. Whispering Willows is the award-winning debut of Night Light Interactive and is haunting in every sense of the word. I’m a sucker for personal games. Experiencing the life of another through gaming is one of the most important things our medium can do. Memoir En Code is the autobiographical story of Alex Camilleri throughout different periods of his life. Memoir En Code is thoroughly personal, and deeply rewarding. Adventure games have never been more beautiful. Samorost 3 isn’t just a looker, either. Beneath it’s award-winning visuals lies a set of devious puzzles and a classic tale of friendship. Fall in love with the effortlessly brilliant series all over again.